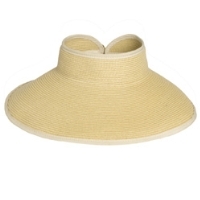 Something new for you straw hat lovers: a straw visor! This fine piece of headwear also features a straw bow on the back velcro closure for that feminine touch. And better yet, it rolls up and is held by an elastic loop for easy storage.